On May 7th, 2011, Tipton-Haynes joined with museums across the region to provide free admission as part of the Heritage Alliance Doors Open! program. 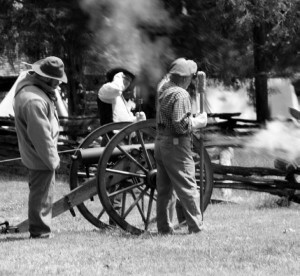 Springtime in Haynesville: 1861 was the first event of the site’s five-year celebration of the Civil War Sesquicentennial, the 150th anniversary of the Civil War. Springtime in Haynesville transported guests to the spring of 1861 where they could participate in mustering, marching drills, and canon demonstrations. Visitors had the unique opportunity to join Mrs. Eleanor Haynes and her daughter Ann Helen for afternoon tea in the dining room of the historic house. Mules were also on hand to plow the demonstration garden and sorghum field in preparation for planting.